Check out Ms. Kahn's picks! Click the triangle above to hear Ms. Kahn 's review of Susan Cooper's book, Ghost Hawk. In the first episode of the 2012-2013 school year, Myra McEntire, author of Hourglass and Timepiece, sits down with two readers for an interview. Get Reading Vol. 2 No. 1 from Elizabeth Kahn on Vimeo. Two 7th graders sit down with visiting author, Aimee Agresti, to talk about her books and more. Aimee is the author of the Gilded Wings series. In this special episode of Get Reading, author, Andrea Cremer sits down with two readers. These students interview her about writing and the completion of her Nightshade series. 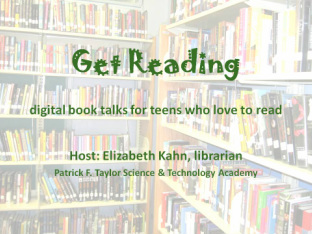 This is another special episode of Get Reading. Jewell Parker Rhodes, author of Ninth Ward, joins two seventh grade students for a conversation about her book and writing. This episode highlights two books from the the darker side of life: The Dark Days of Hamburger Halpin by Josh Berk and Blood Wounds by Susan Beth Pfeffer. Dystopian tales are all the rage but these two are worth the read: Divergent by Veronica Roth and Delirium by Lauren Oliver. Companion books: There She Went by Gayle Forman and Sweet Hereafter by Angela Johnson. Chronicles? Meet author Heather Brewer when she visits PFTSTA. Books for the middle school reader: Lemonade Mouth by Peter Mark Hughes and Exodus by Julie Bertagna. Books for the urban traveler: Dash & Lily's Book of Dares by Rachel Cohn and David Levithan and Revolution by Jennifer Donnelly. Books for the more mature reader: Shine by Lauren Myracle and Blink and Caution by Tim Wynne-Jones.